Day 41 can be summed up by three words: cleaning, thunderstorm, and annoyance. We like seeing them have fun, but there weren't going to be any electrocutions on Abby's watch. The night of Day 41, all THREE ghosts were active, tag-teaming and scaring the bejeezus out of everyone in the house so intensely that I couldn't keep Abby sane and in the green enough to protect the rest of them. 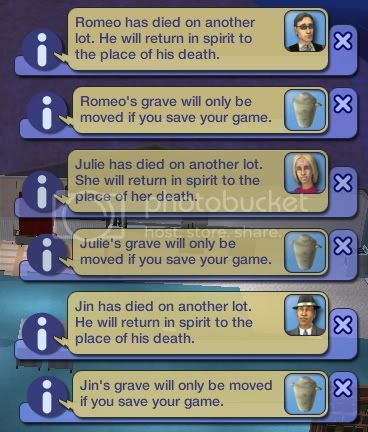 It occurred to me that I was no longer having fun with this amusing ghost problem, and that, moreover, I'm already going to have like negative a million points for losing three sims and playing this house for so long, so what do I care if I lose points for moving graves off the lot? I decided I didn't. So long, suckers, and good riddance. 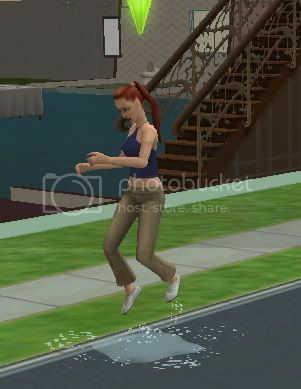 Maybe now I'll see how well the sims can handle their moods and skills autonomously, WITHOUT the extreme crippling effect of being triply haunted every other night. :) Hoorah! I don't know how you put up with the ghosts so long. Glad you got them out of your hair!!! I played SO LONG yesterday without blogging that I'm almost done, but I'll have loads of entries coming up, so yay! Then onto my prosperity challenge!